CAPTBLACKSHEEP has no current links. 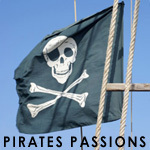 I just like pirates always have and always will. I love the thought of being free and as horrible as it might sound, after being ran over by a crapload of women I realized I was way too selfless. So somewhere along the line I learned the pirate joy of greed and self interest. Harr!